Well, this book was really REALLY good. this book started out hilarious and only got better as the book went on. The story was the typical cliche plot, the good girl falls for the "bad" boy and then realizes that he isn't that bad, but Morrill totally takes this cliche and makes it her own! I enjoyed the characters immensely and i thought when they were together they made the perfect couple. I loved how they were complete opposites but they just worked. The downside of this book was that they were both so STUBBORN, oh my lord i face-palmed myself so many times while reading this book, they just kept doing the opposite of what i wanted them to do! No matter how many times i told them they just never listened! i had to knock off a star because i really didn't like Julia that much, i felt that she was kinda of immature definitely not as immature as Jason, but she definitely needed to grow up. For someone who is so safe and follows the rules she was willing to meet up with someone that she doesn't even know or remember do to the fact that she was drunk. I also found myself being annoyed with her because of the whole MTB thing, it felt like something i said in middle school, and she was 17 or something, and was holding on to that notion like it was a lifesaver and she was drowning. And Jason wasn't always amazing either, i found myself loving his character but like Julia, i was getting fed up with the immaturity. By the time i got to the end i could forgive him for all of it but i couldn't forget it so... 4 stars! One of the things i liked most about this was that it wasn't all about love and finding your MTB, yes that is the main plot, but i loved when we got glimpses of Julia and Jason life, when we found out about there parents i felt like those facts brought the whole story together and you could see another level that the characters could connect on! I loved the writing and pacing of this book, right from the beginning Morrill pulls you in. 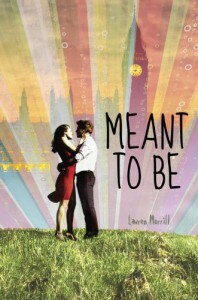 With all the humorous situations, the fighting, and roaming around London Meant To Be is a must read!